nepenthese by yams makes games! Nepenthese is a card game that, through actions or questions, brings two people together and mimics the feeling of falling in love. With a die, each player rolls for their respected card (even rolls get an Action, odd rolls get a Question) and gain a point for every action they do or question they answer. The game is won when the players collects 10 points together. NOTE: This game was created for UC Santa Cruz's ART80G: Visual Communication and Interaction Design and is my first card game. The inspiration for my game came from the problems I was finding in my sophomore Fall quarter. There was a lacking sense of love for one another between friends and a past romantic relationship had me craving a better way to help my partner express some of their vulnerabilities. The name Nepenthese came from Homer’s The Odyssey as a drug called nepenthes that “banishes grief or trouble from a person's mind”. Since the problems with the people I cared most about were obviously troubling me, I felt like it would be a fitting name for a game that would rid me of the fears I had about those said relationships. Plus, I felt like it was a funny play on the concept that “love is a drug”. For my art, I wanted to reflect that sense of vulnerability by incorporating delicate drawings of flowers. The gold circle serves as both a form of geometric balance and represents the sun, which is supposed to symbolizes the sunny, good feelings you should get during and after gameplay. 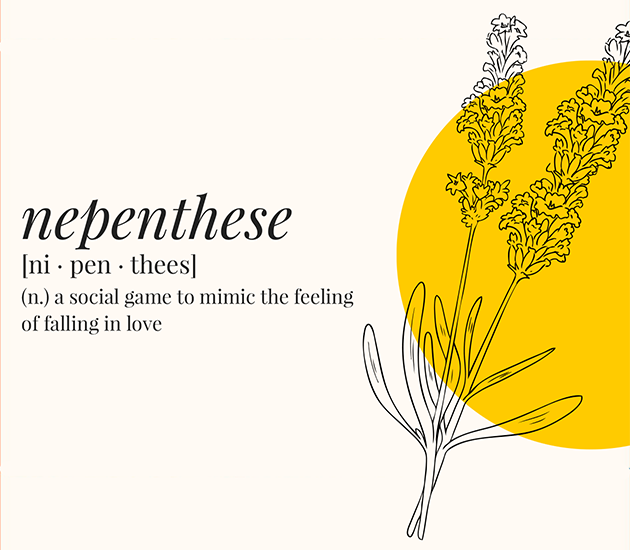 Aesthetically, I wanted my players to feel as though they’re falling in love with one another, but I intentionally did not define ‘love’ within the game. I feel that love transcends the usual definition which is ‘romantic love’, and I didn’t want my game to feel like you were forcing two people to fall in love with each other romantically. Love should be the wholesome appreciation one has for the other; it should be a feeling that allows both parties to be comfortable and vulnerable with each other and safe within each other’s company. Because of that, this game’s definition is also pretty broad: I wanted the players to interpret what kind of love they wanted to fall into through what they were comfortably willing to do and express. To further express this idea of love, I made it crucial in my rules that players cannot proceed with certain cards if there is any discomfort from any of the players. Love should never be forced between peoples, and my mechanics are strict on that. The game is still winnable if a few cards are skipped, and the appreciation one should be getting for the other by learning certain things from them described in the question cards and doing some of the intimate action cards should still be present whether you’re capable of doing every card or not. The difficulty of this game also differs when different kind of players play. Love is a learning process, but when it is achieved, it should come as the easiest thing in the world. So to represent that, I made certain action and question cards quite difficult if players are not used to a specific kind of intimacy from each other. But, players that are either already lovers or really good friends find these cards very easy to do and quickly finish the games. The mechanics of Nepenthese are very simple. You roll a die to determine what card you pull, which was described in the summary. The player that rolled will read the card out loud for their partner to hear. You can only do the action and answer the question if both parties are mutual in their comfort over said card. Every card completed is in turn a point. When players collect 10 points together, the game is won.